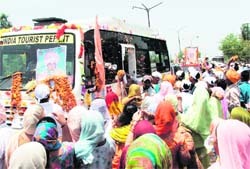 The procession carrying the ashes of Baba Rama Nand, deputy head of Dera Sachkhand, passed through the city peacefully. Two government officials are embroiled in a controversy for getting a message inserted in a vernacular newspaper for paying tributes to ‘‘martyrs of Ghallughara’’ and calling Operation Bluestar “an attack on Golden Temple by the then Indian government’’. The Municipal Corporation's move of allotting advertising rights to Greenline agency is all set to make the city full of advertisement billboard banners as the agreement signed between the municipal official and the agency clearly states that 200 new unipoles could be erected. 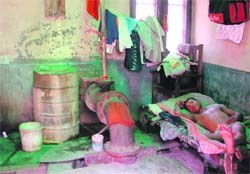 Tubewell rooms of the Municipal Corporation have become a safe haven for the poor these days. One just has to do certain jobs assigned by the tubewell contractor to get a roof along with power connection. The police officers must be heaving a sigh of relief after the arrest of notorious Rajiv Raja, but for the lower rung city cops, Raja is still a dreaded criminal in hiding and a possible threat for city jewellers. 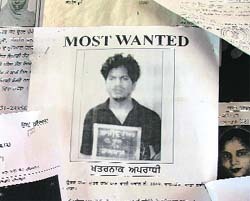 The poster of Rajiv Raja could be easily spotted at the top of the list of wanted criminals in a majority of police stations. Ironically, most of the cops are not even aware of his arrest by the Haryana Police. What to talk of common man, even the VIPs and top industrialists are not far from the reach of snatchers. In a latest incident, three motorcycle-borne youths snatched a mobile of Kamal Oswal, son of noted industrialist Jawharlal Oswal, here this morning. 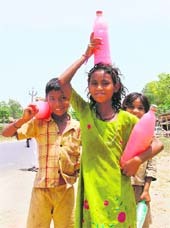 Gone are the days when students used to relax at home during the summer vacations. Now come holidays, each parent is anxious to develop one or the other extra skill in his child, whether it is painting, singing, dancing or yoga. Every school is humming with one or the other activity. A special educational promotion meeting was held yesterday between Deputy Director (s) Shashi Sharma, along with the officers Dr Davinder Singh and Vijay Kaushal on one side, and Rajinder Sharma, president, Association of the PSEB affiliated schools, Punjab , along with R L Sewak, N.K. Bangia, S S Bedi and other office-bearer of the association on other side. The foundation stone of a girls’ hostel was laid down here yesterday. The UGC had released a grant of Rs 80 lakh for building a girls hostel at local Lala Lajpat Rai DAV College. 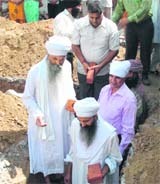 The foundation stone was laid by Sant Baba Gurcharan Singh and Sant Baba Sewa Singh of Nanaksar Kaleran. The principal of the college, Satish Sharma, said the hostel would be a state of art with all the modern amenities and would be completed within 15 months. A valedictory function was organised today on the concluding day of the NSS camp at Guru Nanak Girls College. Prof M.S. Bains, programme coordinator, NSS unit, Panjab University, was the chief guest of the occasion. He motivated the NSS volunteers to always keep in mind the motive of the NSS and try their level best to make this society a better place to live in. A student of Police Public School, Bharowal Khurd, excelled in the matriculation exams conducted by the Punjab School Education Board. 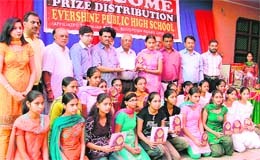 The prize distribution function for the students, who got excellent positions in annual examinations of Classes V, VIII and X in PSEB examinations, was held in March, 2009. Over 200 students of Victoria Public High School, Lehra, showed their potential in various skills during the first phase of the annual summer camp organised at the school near here. After two months of empty seats at multiplexes, the owners are happy that their stand-off with producers-distributors over revenue sharing ended on Friday. But at the same time, the upcoming T20 World Cup is likely to affect new releases and it is assumed that big films would release only after July. A sewing centre was inaugurated to provide training to a batch of girls of rural area at Manupur village near here today. The camp was organised by the Nishkam Kirtan Sewa Society. The chief guest Inspector Devinder Attri landed the efforts of the society, which has organised 94 marriages of the poor girls, beside other social activities. The railway passengers here are facing harassment for last more than a year due to acute shortage of licensed porters at the railway station, while authorities are looking the other way and, except for making repeated announcements about new recruitment, nothing worthwhile has so far been done to mitigate the suffering of travelling public. 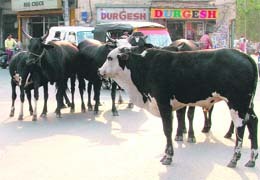 The cattle and dog menace in the city has become a common problem with the Municipal Corporation failing to taken any steps except giving statements and signing agreements. The growth of these animals in the past few months has further aggrieved the problem and municipal officials and councillors are now tightlipped as they don't have any concrete action plan or funds to initiate any projects. Jewellers heaved a sigh of relief after the news of the arrest of dreaded criminal Rajiv Raja flashed on television channels. The jewellers are feeling relieved as Raja was a constant threat for them. Ignoring the ban on the transplantation of paddy before June 10, some farmers of the area have started sowing the crop in their fields in this area falling under Ludhiana and Sangrur districts. The excise and taxation department conducted raids here on Friday and detained documents for verification. Excise and taxation commissioner Tejbir Singh Sidhu said: “We came to know that a person from Jaipur has entered the state with Rs 63 lakh without getting his credentials noted at the informatics centre. The performance of government as well as private schools has been good in the Punjab School Education Board Class X examination this year. As top positions have been grabbed by private school students, government schools cannot be called laggards as they have their own limitations. 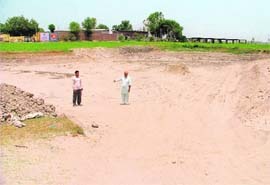 Desilting of a pond at Baniewal village here has become a bone of contention among villagers and the panchayat department as the villagers are protesting against “excessive” digging and distribution of silt to farmers without accepting money and causing losses to the panchayat. A shop was burnt down at Burj Hari Singh Wala near here over a minor altercation the last night. The shopkeeper had asked for his previous arrears from his debtor. Satbir Kumar, in his complaint to the police, has stated that there were some outstanding money towards Prem Singh of the village. Dr Manish Munjal from department of ENT at the DMCH was recently honoured with Dr Anoop Raj Award and certificate of honour at the annual national meet of the All-India Rhinology Society in Mumbai for his presentation on his varied experiences in endoscopic surgery of nose among new-borns and adults. A motorcycle rally was taken out by the Hindu Sikh Jagriti Sena here today against the racial attacks on Indian students in Australia here today. 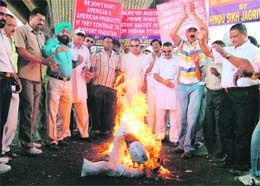 Protesting against the racial attacks on Indian students, the Sena burnt the effigies of the Australian Government. The sena called upon the people to boycott the Australian and American products. The police has nabbed five persons belonging to three separate gangs, involved in anti-social activities in the area for past many years. Goods worth thousands of rupees have been recovered from their possession. Continuing with their winning streak, Ludhiana Hawks overwhelmed Sher-e-Punjab Club 8-0 in the annual Ludhiana Hot Weather Six-a Side Hockey Tournament being organised by the District Hockey Association at the Prithipal Singh Memorial AstroTurf Stadium on Punjab Agricultural University campus here today. The winners established 3-0 lead at half time. Braving the scorching heat and high temperature, around 170 aspirants attended the trials conducted by the Punjab Swimming Association (PSA) at the Municipal Corporation Swimming Pool near Rakh Bagh here today.